The last part of the “Continuous Integration for iOS” series covers the configuration of code metrics. Running metrics are a great tool to analyse the quality of the code on continuous level. And this helps to keep the project clean, maintainable and working. This post covers not all of the available metrics, but at the end I linked a few more static analysis tools that can be integrated in the workflow. It’s up to you how much data you want to collect and what you really need. Please always consider that every metric will take its time. Maybe run the most relevant metrics as a new commit is detected and all metrics only once a day at night. Let’s see how to configure code coverage, lines of code counting, a warnings detector and code duplication. Install Cobertura-Plugin to show cobertura code coverage reports. Install gcovr with Homebrew to generate cobertura reports. Generate the code coverage report. Add post-build action, choose Publish Cobertura Coverage Report and add **/reports/ios-code-coverage.xml. Add Build-Step and choose Execute shell. Add post-build action, choose Publish SLOCCount analysis results and add **/reports/cloc.xml. Add post-build action, choose Scan for compiler warnings and use the “Clang (LLVM based)” parser. Download PMD in version 4.2.5 — the version is important, version 5.1. did not work for me. Install Objective-C language definition package for PMD. Add post-build action, choose Publish duplicate code analysis results and add **/reports/duplicated-code.xml. After all the setup and configuration hopefully everything runs great and this post was somehow helpful. Especially the metrics stuff needs a lot of fine tuning to be really meaningful. But very often the graph alone gives an idea in which direction the code/project is developing. In the end here are some paths, links and resources that may help the one or the other. Now that the Jenkins server is running as a Launch Agent, it’s time to create a build job for building and testing an app. The first step is to provide Jenkins the necessary certificates and provisioning profiles. Add them as always to the keychain of the current user. Attention! If the Jenkins asks for access to the Keychain, press Always allow in the appearing popup. Otherwise the build process will stop. Alternatively you can unlock the keychain via script (this exposes your password – not recommended! )Additionally I had to login to the Apple developer account in Xcode, otherwise the provisioning profiles won’t be recognised. Choose New Item from the left side of the Jenkins dashboard. Choose Build a free-style software project, give it a speakable name and click OK.
Add a description (html is supported) that explains what the job is doing, when it is triggered and which steps are executed. Select Discard Old Builds and set Max # of builds to keep to 10. Configure Source Code Management (the repository url, credentials and the branch to build). Choose Add build step. 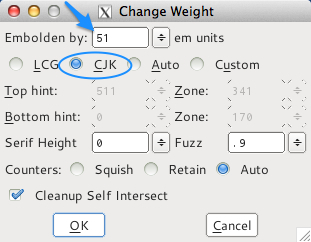 If you want to use the Xcode plugin, choose Xcode and fill out the parameter inputs. Or choose Execute shell if you want to follow along and use the script approach. If you want to leverage the full power of the script approach, have a look at this build system. Choose Add post-build action and then choose Publish JUnit test result report. Add test-report/*.xml into the field Test report XMLs. After some builds, when enough data was collected, a graph will be shown in the status view of the build job. The best way to install Jenkins is via Homebrew. It is less problematic compared to the installation with the installer or the war-file. If you’re still interested in these ways of installing Jenkins, please see this nice blog post. 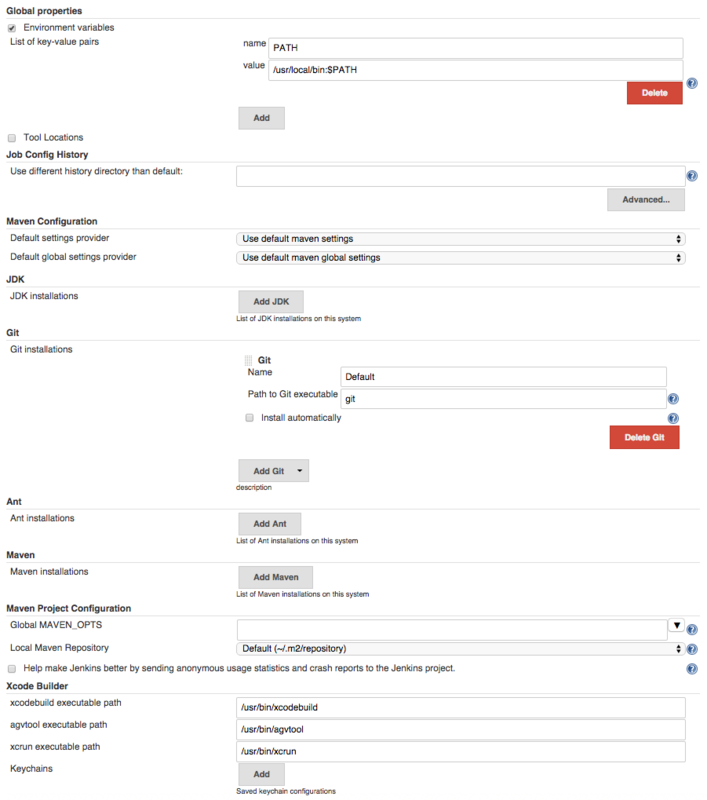 Configure Jenkins as Launch Agent not as Launch Daemon. A few words about this, because it is important. There are some differences. Most important, Jenkins needs to be run as a Launch Agent to execute tests. Otherwise it has no access to the window manager and therefore can not launch and interact with the iOS Simulator. The other major difference is, that a Launch Agent is started after the user has logged in (because it runs on behalf of the user), while the Launch Daemon is started at system start. For more information about the differences between Launch Agent and Launch Daemon see these blog posts . Create the directory for Launch Agents if it does not exist. Copy Jenkins’ plist to the Launch Agents directory. Now Jenkins gets started right after the user has logged into the system. If you want more automation, you can use the automatic login, (‘System Preferences → Users & Groups → Login Options → Automatic login’). But this reduces security because the system is not password protected anymore. I am ok with entering a password if I work directly on the machine once in a while. And usually the Jenkins does not reboot that often. The web interface/dashboard of the Jenkins server should be reachable at http://localhost:8080. Set the heap size minimum and maximum with -Xms and -Xmx to give Jenkins a bit more memory power and let Jenkins use a 64-bit data model, if available, with -d64. Usually Jenkins runs on ‘127.0.0.1:8080’. These values have to go to the ‘jenkins.war’ file. If you face the problem that the Jenkins dashboard does not open, try to enable access from all IP addresses by setting ‘httpListenAddress=0.0.0.0.’. If you want to know more about the other configurations like HTTP proxy, garbage collection, environment variables, redirect stdout and stderr, etc., read the configuration part in this blog post. The last plugin helps to configure the iOS part of the build process. You make some definitions and the plugin executes the rest of the build process. If you don’t want to have your build configuration stored on Jenkins only and want to build your apps locally on your machine the same way, use build scripts. Commit these scripts to your VCS and you have an executable build system everywhere where the project is checked out. 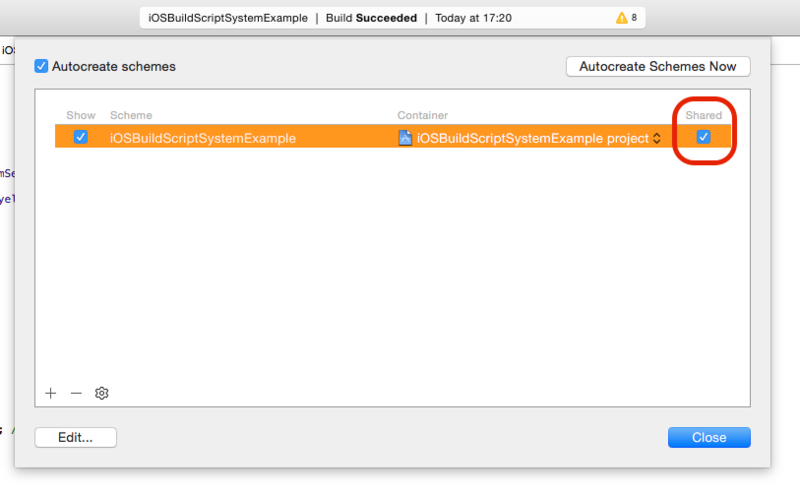 To default build tool is xcodebuild, which is part of the command line tools. But its output and flexibility regarding test execution could be better. And xctool does this job better. The configuration is almost the same. Manage the Jenkins. 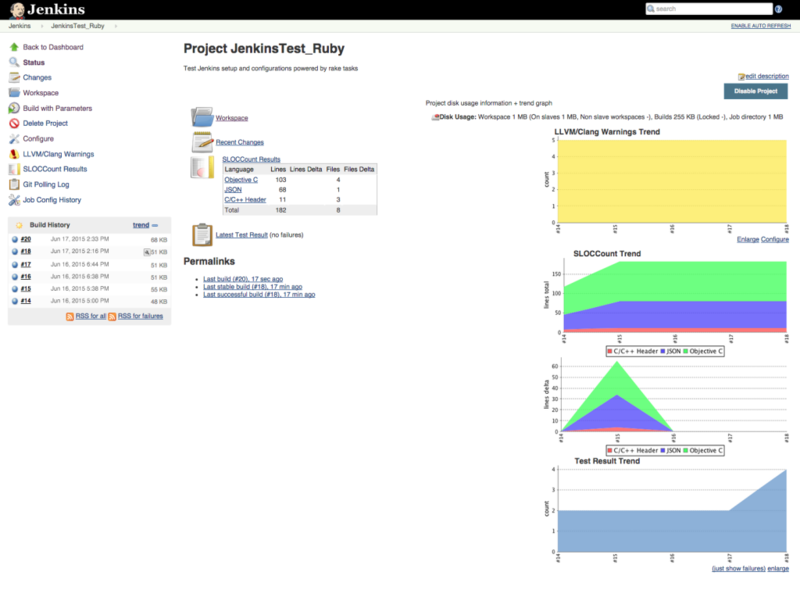 From the left side of the dashboard select Manage Jenkins. Extend PATH variable, otherwise you have to to specify full qualified paths for commands. Under Global properties select Environment variables and add a variable named “PATH” with the value /usr/local/bin:$PATH. Define how users are created and how they authenticate, under Access Control. The easiest way is to let Jenkins manage usernames and passwords by choosing Jenkins’ own user database under Security Realm. Set credentials which will be used by build jobs and Jenkins itself (i.e. for access to integrated systems like GitHub or Stash, …). Set a SSH private key and give it a speakable name. Share all schemes that should be used in Jenkins. Continuous integration for iOS is an important part of a professional software development workflow and a helper to automate the build and test process. Besides automatic builds and tests, Jenkins gives the opportunity to run code metrics, to distribute build artefacts to servers or to run every other task which is required for the job. Once setup, a developer can focus on writing code and tests. Jenkins does the rest of the job. And this always the same way and while the developer is coding. At the end you get stable build results and an overview about the quality of your code and where it can be improved. There are many blog posts out there, some good, some bad and some wrong. This series here is my summary of infos that I found in various blog posts and tried out in many exploration times. The next four posts contain what I have done to setup a Jenkins on OS X Yosemite which is able to build, test and analyse my projects. Create and/or configure the user account on OS X. Install and configure the Jenkins server. Create and configure one or more build jobs. Configure one or more build jobs to run code metrics. Some of the following steps belong to my personal preferences and are not necessarily required, however very helpful. They are marked with a little (*). Create a new user account with admin rights for OS X. (*) Basically configure the system (faster mouse and keyboard, always visible scrollbars, nice background) and install the tools that make you faster (i.e. a visual git client). Install Homebrew and follow the instructions. Grant Jenkins access to the required source code. Typically this means to generate one or more SSH keys and register them at a hosting service (e.g. Github, Bitbucket, …) For how to generate a SSH key see the awesome Github help page. We all know the .gitignore file as a place to exclude files from the version control system, unless they are not tracked. But once a file is committed, it won’t be affected by the .gitignore system. Sometimes files get used on a general basis or by a CI server. Therefore they have to exist in the repository, but local and individual changes (for testing purposes) should not be committed. To ignore changes in tracked files the .gitignore system is not suitable. Fortunately Git has a way to solve this issue. git update-index. But there are two options for this command --assume-unchanged and --skip-worktree. Long time I was aware only of the first, but then I realised that the second option is in most cases a more appropriate solution for the mentioned problem. Therefore I will try to shed some light on each of these ways and the difference between them. You can set a bit for a file to mark it as “unchanged” so that Git will ignore it. This feature was planned as an option to optimise inefficient filesystems, because it makes Git to omit any checking and assume that the file hasn’t changed in the working tree (see git update-index). The problem is that this bit is not safe and will be overwritten in some cases. E.g. if a modified version of the file is pulled from the remote repository or a git reset --hard will be performed. Instead of fixed file paths, you can use wildcards to ignore all files in a directory with <directory/*>. git ls-files shows the file status represented by a letter. If a lowercase letter is used, the file is marked as “assume unchanged”. Skip <path> to show the status of all files in the repository. (see git ls-files). If this bit is set for a file, Git runs all the normal check routines. Therefore Git knows if a file has been modified but ignores it and takes the version from the index instead of the one from the working tree. This way modifications in the working tree get ignored. The good thing is, that this bit is safe and does not get overwritten. However problems may occur if the file has changed in the local as well as in the remote repository. Stashing will not work and you have to manually reset the --skip-worktree bit. But this seems to be pretty ok. If the file is marked as “skip-worktree” git ls-files shows a “S”. If it is a lowercase “s”, the bit for “assume-unchanged” is set to. But the “skip-worktree” bit rules. A post in the FallenGameR’s blog contains a good summary of the differences and the use case for both options. I will wrap up the essential differences here. Please see the mentioned blogpost for more details. File changed in local and remote repository. git pull Git wouldn’t overwrite local file, but output conflicts. Git wouldn’t overwrite local file, but output conflicts. File changed in local and remote repository. git stash & git pull Discards all local changes, no option to restore them. Stash wouldn’t work. Manually unset “skip-worktree” bit first. File changed only in remote repository. git pull File is updated, “assume-unchanged” bit is unset. File is updated, “skip-worktree” bit is preserved. File changed only in local repository. git reset --hard File is reverted, “assume-unchanged” bit is unset. File is not reverted, “skip-worktree” bit is preserved. After all the “skip-corktree” is the better fit for the mentioned problem and indeed it does a really good job in practise. But no matter which option you choose there is one point to consider: The chosen bit will not be propagated by git push. This means that every user has to run the required commands individually. 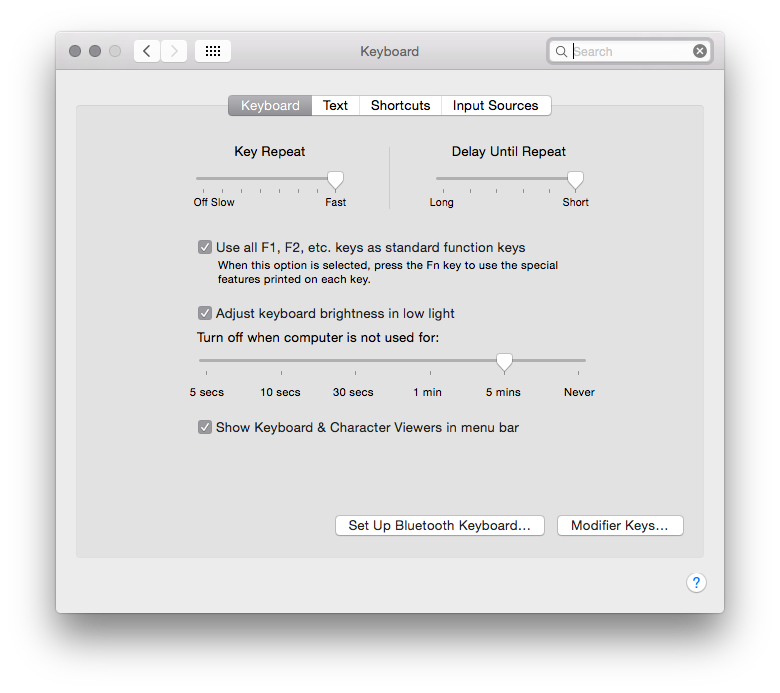 The best you can do is to write a small script that contains these commands (and maybe some other settings). Then everybody can run this script after the first checkout of the repository. There is a detailed description about this point on stackoverflow. [master (root-commit) a6053cf] Adds a new file. For games performance is key. But also style and visual appearance are important, especially in iOS games. And sometimes your local artist comes with a great idea: He wants to have outlines around the labels. “Great!”, you might think, “This won’t be a hard job!” — You are right. To achieve an outline around a label in iOS, you can use one of the many approaches out there. The bandwidth reaches from utilising the shadow properties of UILabel (UILabel with Stroke, THLabel), which works for iOS 4.0+, till the attributed text, which was introduced in iOS 6.0 (UILabels in iOS 6). The last is the most efficient solution in terms of performance. But each of these approaches reduces the performance when the labels get drawn. You can feel this in a game or application, if you scroll a long list, that contains many labels with an outline. The feeling is even worse, if labels get updated really fast. This was not acceptable, especially not in our game, where we want to have the best performance that is possible. Therefore I searched around a lot and profiled every of the before mentioned approaches. The result was not satisfying. None of them was performant enough. So, what else? Fortunately an other game team at Wooga was researching too and Kamil Chmurzynski and Lucas Bellett came up with a great solution of the 2-label-approach. The idea is to have a dedicated outline font instead of using only a bigger version of the normal font. 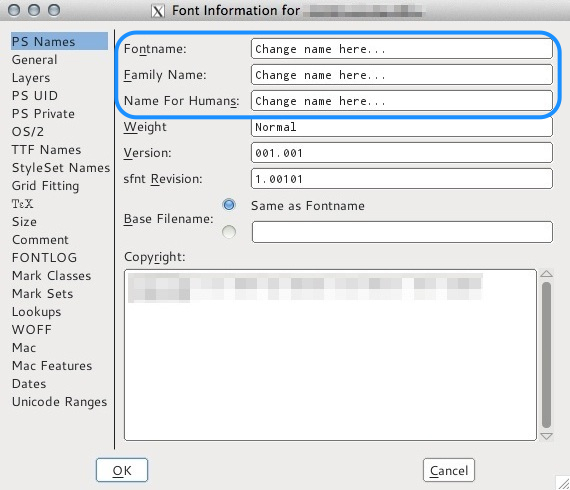 They use a tool named ‘Font Forge’ to create proper outline fonts. The tool itself is really powerful and you can do advanced stuff, if you have enough knowledge in font science. Spectacular, this works great! In one specific situation, which was my test case, I measured that this approach is 5.5 times faster then the one we had before (and this was already the fastest of the previously mentioned approaches). 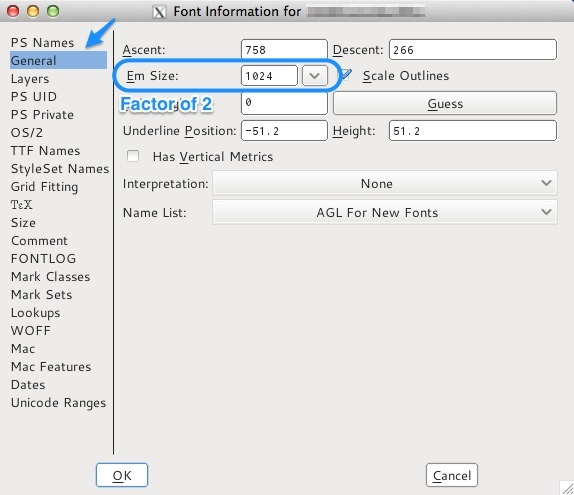 This step is important since you don’t want to show up duplicate fonts. I created an ‘OutlinedLabel’ that inherits from UILabel. It contains some stuff for a convenient use but the essence is in the overridden drawTextInRect method. Here the label text gets drawn two times. The first time is the outline with the new created outline font and an appropriate color. The second time the fill is drawn with the adjusted base font and a fill color. There is no need for managing 2 different labels. A small test project that shows the outlined label in action, you can find on github (Outlined UILabel). Cool, the only thing to do is creating a special outline font, use it and this solves all of our problems? No! This approach works great for numbers. And it also works for characters that are included in your base font file. To avoid this you can choose a font that contains all required characters. If you need Arabic, Japanese, Chinese, Korean, Latin, … characters, your font file size will be increased a lot. And with a bigger base font and a bigger outline font (which is usually even bigger then the base font) the bundle size of the application/game gets increased tremendously. In the end it is clear, that there is a performant way to get labels with outlines. But I ask myself, if and where this approach is really useful. Outlines work great for numbers anyways. For normal text you see the outline only if there is no font substitution happening. Therefore you have to take care, that the text stays readable even without the outlines. These leads me to the question why to use outlines for normal text at all? And if you use no outlines for normal text, it may be even more consistent to avoid outlines for numbers as well. With these questions in mind, the described approach can be only used without any drawback, if the application/game has all required characters in the custom font. This means, if no font substitution will happen. But after all these questions and thoughts, it is a matter of the design of the application/game, if outlines are needed and in which way they get realised. Finally the slides for my last talk are online. Find an english version as well as a german version on my slideshare account. At the Clean Code Days 2013 in Dresden, I will give a talk about Social Game programming related to Clean Code. The talk is in German, but I plan to publish the slides here and if I can manage it, they will be translated too. Have you ever needed an UIView that does not react on touches itself? 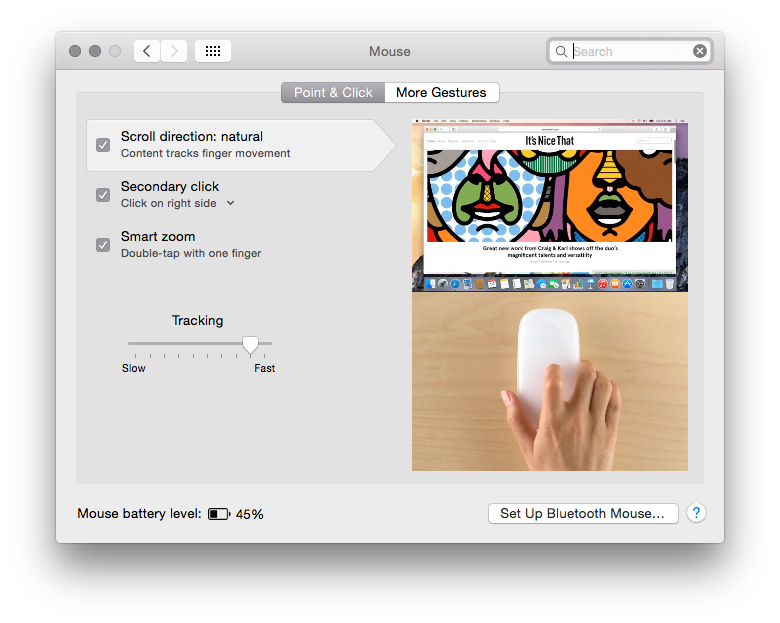 It is often used as an invisible layer and container for other UIViews. But no matter, if you are interested or need such a thing, you can find it here on github. Nowadays every programmer uses git as the preferred version control system or at least is familiar with it. Some use the command line interface, others favor visual git clients. My favorite is the powerful Tower. It is easy to use, informations are quicker to find and it offers most of the features you will need to work with git. But the app has one major drawback. If you have a development workflow that utilizes git hooks to automate certain things, it could be that Tower shows you some errors. If one of the git hooks is using ruby and requires some special gems, Tower does not know them, if you have them installed in your custom ruby environment. Mostly ruby is managed with either rvm (ruby version manager) or rbenv. Install all the gems you need for this ruby version and Tower will work as expected.